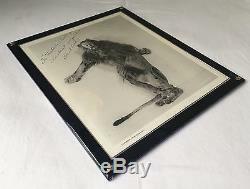 WIZARD OF OZ BERT LAHR SIGNED PHOTO AS THE COWARDLY LION COA PSA/DNA AUTOGRAPH. 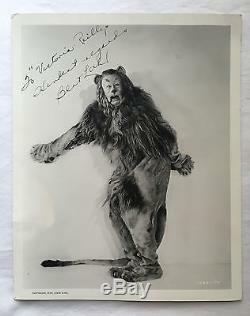 SIGNED PHOTOGRAPH OF BERT LAHR AS THE COWARDLY LION. From the collection of Hollywood Wardrobe Mistress Victoria Reilly. 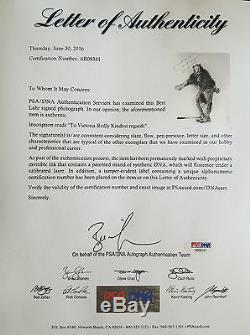 Accompanied with A Letter of Authenticity issued by PSA/DNA. 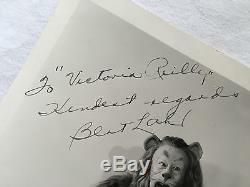 Spectacular and extremely rare and desirable vintage glossy 8 x 10 MGM Wizard of Oz promotional photo of Lahr as the Cowardly Lion, signed and inscribed vertically in fountain pen "To Victoria Reilly Kindest Regards Bert Lahr". 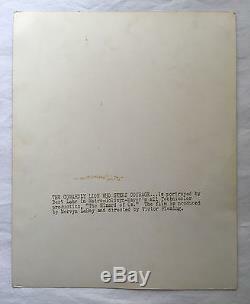 Back side has stamp from studio and Reads: THE COWARDLY LION WHO SEEKS COURAGE Is portrayed by Bert Lahr in Metro-Goldwyn-Mayer's all Technicolor production, "The Wizard of Oz" The film is produced by Mervyn LeRoy and directed by Victor Fleming. Normal border wear otherwise in very good condition. Signed photos of Lahr as the Cowardly Lion are virtually nonexistent! Most of the handful of known examples were signed in ballpoint in the 1960s and sent out after Lahr's passing. This one, signed earlier and in fountain pen , is the true definition of vintage, setting it a cut above the rest. Victoria Reilly was a dancer and wardrobe mistress! A wardrobe mistress is in charge of keeping theatrical costumes cleaned, pressed and in wearable condition. She obtained many signed photos, inscribed from stage & film artists from 1900 -1940? Also various photos of Victoria Reilly who was a wardrobe mistress for many years. Copies of Newspaper articles will also be included. She really did have such an interesting life behind the scenes and was very much loved by so many movie stars for her lifetime dedication of hard work! American comic actor, fittingly born a Leo in New York City, he is best remembered today for his role as the Cowardly Lion (and the farm-worker Zeke) in the classic 1939 movie The Wizard of Oz, but known during his life for a career in burlesque, vaudeville, and Broadway. He later remarked, After The Wizard of Oz I was typecast as a lion, and there aren't all that many parts for lions. Accompanied with A Certificate of Authenticity Also various photos of Victoria Reilly who was a wardrobe mistress for many years. She really did have such an interesting life behind the scenes and was very much loved by so many movie stars for her lifetime dedication and hard work! Marcus Loew was born in New York City into a poor Polish Jewish family who had settled in New York City the year before. He was forced by circumstances to work at a very young age and had little formal education. Shortly after, in partnership with Adolph Zukor and others, Loew acquired a nickelodeon and over time he turned Loew's Theaters into a leading chain of vaudeville and movie theaters in the United States. A few years later, he acquired a controlling interest in the financially troubled Goldwyn Picture Corporation which at that point was controlled by theater impresario Lee Shubert. Mayer's company folded into Metro Goldwyn with two notable additions: Mayer Pictures' contracts with key directors such as Fred Niblo and John M.
Stahl, and up-and-coming actress Norma Shearer, later married to Thalberg. Mayer would eventually be rewarded by having his name added to the company. Would act as MGM's financier and retain controlling interest for decades. While immediately successful, Loew didn't live to see the powerhouse that MGM was to become. He died three years later of a heart attack at the age of 57 in Glen Cove, New York. It is our desire to offer collectors of fine autographs and memorabilia the opportunity to acquire items of the utmost authenticity and quality, all backed by a lifetime guarantee of authenticity. Each piece is accompanied by a Certificate of Authenticity which is more than just a piece of paper: it's an iron clad bond issued by a member of the mainstream autograph community who has a reputation as a full time and respected dealer. We offer a large variety of inventory consisting of all genres; rock and roll, historical, film, literature and much more. Please don't hesitate to inquire if you are looking for something special. 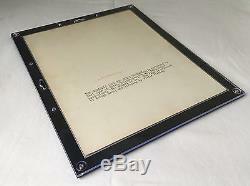 We warrantee and represent that the goods are as described in the above listing. We specifically disclaim any implied warranties of title, merchantability, fitness for a particular purpose and non-infringement. Customers should satisfy themselves that any item choice made is suitable for their intended purpose or use. We pride ourselves on our customer service. If any item we sell is declared to be not authentic, we may, in certain cases, ask for at least 3 written opinions from competent authorities acceptable to us. You may also be interested in.... 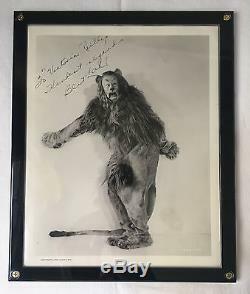 The item "WIZARD OF OZ BERT LAHR SIGNED PHOTO AS THE COWARDLY LION COA PSA/DNA AUTOGRAPH" is in sale since Thursday, August 4, 2016. This item is in the category "Entertainment Memorabilia\Autographs-Original\Movies\Photographs". The seller is "trishhesseyautographs" and is located in Rancho Cucamonga, California. This item can be shipped worldwide.